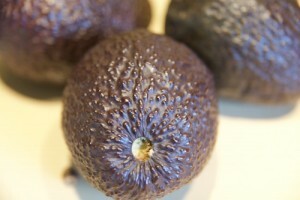 The avocado is a unique fruit because of its high fat content and low sugar levels. It has a high nutritional value, and is very much appreciated by vegetarians due to its high content of high quality protein and fat, in addition to vitamins, minerals and fiber. This is why avocado is considered one of the healthiest foods, and it is even considered a superfood. P inch the tops and bottoms and when they yield to pressure on both ends they are ripe. Make the avocado ripeness test: remove the stem, if it’s green inside then it’s underripe; if it’s dark brown then it’s overripe; if it’s yellowish then it’s just right. Watch here the avocado ripeness test. 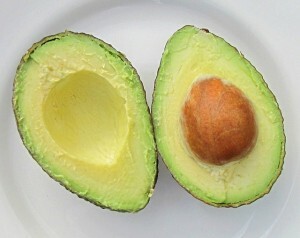 Avocados provide all of the essential amino acids (those that must be provided by our diet), with 18 amino acids in all. Avocados contain more protein than cow’s milk, about 2% per edible portion. Unlike nuts, avocados don’t have anti-nutrients that may counter the good nutrients. The fat content (by weight) varies from 7 to 26% according to the variety, averaging 15%. Approximately 63% of the fat in avocados is monounsaturated, 20% is polyunsaturated and 17% is saturated. So the majority of fat is oleic acid, which has been linked to reduced inflammation. The fat they provide is more digestable than animal fats. Avocados are busting in nutrients: vitamins A, B-complex, C, E, H, K, and folic acid, plus the minerals magnesium, copper, iron, calcium, potassium, and many other trace elements. The fiber ccontent of avocado is 7%, which is very high compared to most other foods. 25% of this fiber is soluble and 75% insoluble. Soluble fiber is said to feed the friendly gut bacteria in the intestine. For optimum digestion, eat avocado alone or with any non-sweet-non-starchy fruit or any non-starchy vegetable food. Eating avocado with leafy greens, celery and/or cucumber will enhance the digestive process as additional digestive enzymes are secreted. Don’t eat avocado with any other kind of oily, fatty or high-protein food such as seeds, nuts, coconut, olives, yogurt, cream, cheese or meat. Avocados are native to Mexico and Central America, so europeans are not very used to this kind of food, although now it’s cultivated also in some Mediterranian countries such as Spain. At the beginning of introducing this food, some intolerances or allergies may appear. Avocados are very high in histamine, so better avoid it if you have histamine intolerance. It’s a medium salicylate content food, so be careful if you follow a low salicylate diet such as Feingold diet. On the other side, avocado is low in fructose, so it will be a good fruit if you have fructose intolerance. 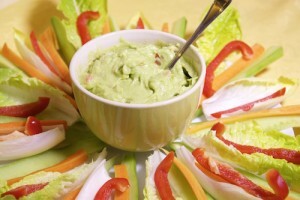 Enjoy your avocado with a salad making a delicious guacamole!